It is summer vacation, and Cody has been left in the care of her teenage brother, Wyatt, while their mother begins a new job and her father works as a long-distance truck driver. While Wyatt studies anatomy to prepare for "doctor camp," Cody meets Spencer, a boy staying with his grandmother, GG, down the street. Cody and Spencer become fast friends, as they work together to hypnotize first GG's cat Mew Mew, and then Wyatt's long-time crush, Payton Underwood. Though there are elements of Cody's character that call to mind beloved kidlit personalities like Clementine and Ivy and Bean, she is very much Tricia Springstubb's own fresh addition to the canon of literature for middle elementary readers. 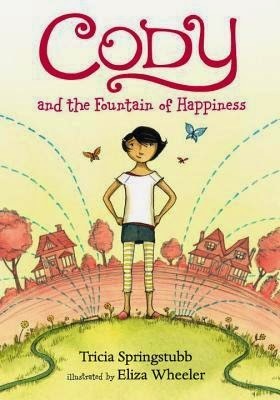 Cody is smart, sweet, and self-sufficient, but with a strong imagination that can lead her into mischief. She loves her mom and her brother, even if she can't help but tease him, and she is also kind toward Spencer, who is dealing with his parents' absence and impending divorce. Though the world of the story is small (Cody's neighborhood), and the events of the story mundane at first glance, there is never a dull moment in this book. Springstubb knows how to bring truth to the surface no matter her characters' surroundings and the result is a chapter book which is both fun to read and of highest literary quality. 2015 is really Tricia Springstubb's year! Don't miss Moonpenny Island, her other fabulous recent middle grade novel, which came out in February. I've been debating whether this one is too young for grades 6-8. My 6th graders this year are struggling with reading, so I might buy this. Sounds interesting. I'm always in awe of writers that can take ordinary events and circumstances and create a fun story. Auww, this one looks good! Thanks for featuring this!